In 1996, a little independent company called Hue Forest Entertainment released an unassuming adventure game called Amber: Journeys Beyond, which remains their only published title. Amber casts players in the first-person role of an unnamed protagonist who, by means of various ghost-hunting equipment scattered throughout a haunted house in North Carolina – including the hi-tech device called the Astral Mobility By Electromagnetic Resonance – must enter the minds of three restless spirits who inhabit the mansion and help them move on. Inspired by Myst, the game was not a commercial success, unfortunately, and it took several years to garner the attention and praise it deserves, and even then its popularity was short-lived, undermined by serious compatibility issues as the years passed. But that takes nothing away from the quality of the game, which set the early standard for the many indie horror developers today. Each story is told through a different graphic style that instantly conveys the mood related to its particular ghost, from the faded photographs that make up the memory of a woman who died during World War II to the strangely distorted perceptions of a gardener obsessed by UFOs, or the watery images that form a child's sad reminiscences of a distant, snowy winter. 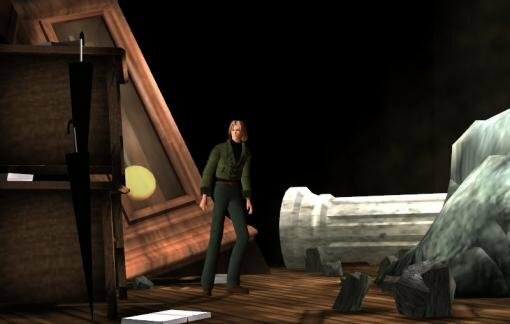 Despite an ending that is perhaps a bit too abrupt, Amber’s crisp graphics, polished interface and streamlined but elegant gameplay created a memorable cult classic, capable of capturing the gloomy, sorrowful ambience of the best Victorian ghost stories with rare sophistication. Years before the ghost-hunting adventure became the popular sub-genre it is now, this game showed what a small indie team could achieve in a solitary first-person horror, and to this day it remains perhaps the best of them all. You can use up a lot of appendages counting the number of adventure games classified in some branch of the “horror” genre, including many that are too timid to be genuinely frightening, and others that try so hard with stereotypical “scare” clichés that they wind up as unintentional comedies. 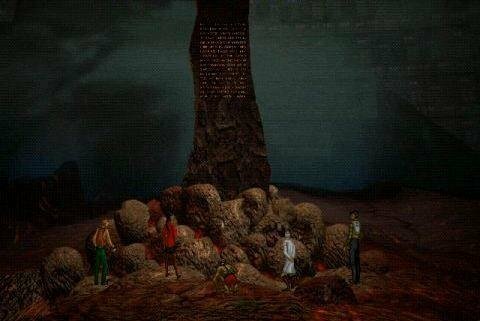 However, the number of truly scary psychological horror games can be counted on very few fingers, and one of the greatest is the uncompromising and horrifying 1995 Dreamers Guild adventure I Have No Mouth, and I Must Scream. Based on a short story by Harlan Ellison (who wrote all dialogue for the game despite not owning a personal computer), the game follows the post-apocalyptic quest of five humans, imprisoned and tortured in their own private hell by a sentient super-computer named AM, as they seek to escape and defeat their captor. If alternating between five characters described as a suicidal loner, a distorted brute, a hysterical phobic, a secretive sadist, and a cynical paranoid doesn’t sound intriguing enough, than perhaps the disturbing imagery of people impaled on meat hooks, or mutilated children in Nazi camps will do the trick. This is an unapologetically twisted game, but one that is well-constructed with an involving and complex narrative, never resorting to cheap scares or contrived horror. While gameplay is traditional, the game features a spiritual barometer that measures good and evil acts, and factors into which of the multiple endings you'll receive. The game is also visually detailed (in all the worst ways for those with weak hearts) and has outstanding voice acting. It may not be a game that anyone would consider “fun”, but if you can handle this type of relentless psychological horror, you will be hard-pressed to find many adventure games that do it as well. Konami’s Shadow of Destiny opens with a violent death: your own. 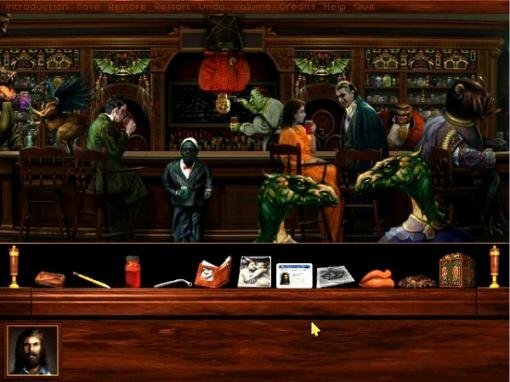 No, it’s not the shortest adventure game in history, but it’s surely one of the most unusual. Playing as hapless murder target Eike Kusch and armed with a pocket-sized time-travel device, you must stave off successive murder attempts by repeatedly turning back the clock – sometimes by a few minutes, sometimes by a few centuries – with the goal of changing the past in ways that impact the present and thwart the killer. Though it’s a relatively short game in a single playthrough, few adventures offer Shadow of Destiny’s replayability, due to its branching story threads and eight different endings. And even fewer games will leave you mulling over the story’s implications and questioning its true meaning long after you’ve finished, as this one surely does. With each replay you learn more about what’s going on and only after seeing all of the endings will you truly understand this intriguing narrative puzzle. One of the very few adventures being developed and published by a mainstream game company at the time, Shadow of Destiny (or Shadow of Memories in Europe) is a multi-platform game first released in 2001 for PlayStation 2, then ported to PC, Xbox (only in Europe), and nearly a decade later to PSP. The PC version was poorly marketed and hard to find even when it first came out, which is likely the reason this game is such a little-known gem even among adventure game fans. The blocky 3D graphics are dated now and the awkward keyboard controls can make it challenging to play, but Shadow of Destiny’s unique storyline and clever time-travel gameplay more than make up for any technical shortcomings, earning it a spot on the list and hopefully some long-overdue public attention. The balance between entertainment and eduboredom has always been an extremely fine line. Among the few adventure games to successfully strike the perfect balance between learning and fun is Sierra's 1993 classic Pepper’s Adventures in Time. It seems crazy Uncle Fred used his time machine to send a little dose of the 1970s to colonial times, and the result is the Liberty Bell being transported around by Hare Krishnas, and a pre-Revolution Ben Franklin telling people to “chill out” while the British governor taxes the people silly. In making sense of all this absurdity, the game features one of the most brilliant devices in modern educational gaming. History has been twisted by the mellowness, but clicking the “Truth bubble” on something tells you whether it really existed in that era. The amount of information contained in those responses is phenomenal, and will appeal to anyone with even a remote interest in American history. All the while the game is teaching, however, it never stops being an engaging adventure with consistent story development as you attempt to restore the period to the way things were meant to be. It's certainly not difficult by any stretch of the imagination, but there are plenty of puzzles. The colonists all have a great deal of humorous dialogue brilliantly written by Lorelei Shannon, bringing plenty of local flavour to the landscape. And of course, how can you not laugh at the spectacle of a laid-back Ben Franklin? (Until you manage to send lightning through his body, that is.) A promised sequel never materialized, but Pepper’s Adventures in Time proved that when done right, there may be no better way to teach foundational concepts of history than a delightfully simple adventure game. In the eternal LucasArts vs. Sierra debates, Legend Entertainment is often unfairly overlooked, as their games were consistently smart, entertaining, and superbly produced. One of the best examples is 1997’s excellent Callahan's Crosstime Saloon. In this adaptation of Spider Robinson's sci-fi stories about Jake Stonebender and his friends at Callahan's bar, the universe is about to be wiped out unless something can be found that proves it deserves to survive. Naturally, only a down-and-out folk singer who can’t pay off his tab is the one to discover what that is. Before he can do so, however, he’ll need to stop an alien race from sapping the world of testosterone, save an endangered strain of orgasmic Brazilian chocolate from extinction, and rescue a lovesick Transylvanian vampire, among other tasks. They’re as daunting as they are diverse, but for Jake it’s all in a night’s work. And hey, no pressure or anything. Between quests you return to the cozy confines of the pub to solve word riddles and chat with the witty, pun-loving locals, which adds a delightful sense of camaraderie to the game. The real delight here is the script, including constantly hilarious commentary on absolutely everything, with plenty of interactive opportunities to experience it, much of it simply for fun and flavour. And yet beneath the bizarre objectives and clever comedy, there’s a real underlying depth to Jake’s own life story that perfectly complements the otherwise whimsical tone. So forget Cheers. Callahan’s is the place to be for good friends, flowing drinks, plenty of laughs, and a whole lot of heart. Plus a darn fun adventure to boot! Great idea, i loved the Top 20 list. Though, I’m already sad to see Toonstruck go this high, but oh well.. that’s the thing with the lists. This would also be a good reminder for the games still to play, i’ve already got my eye on Faust from Day 1. Seriously, I have mixed feelings about this. On the one hand, I can’t help but see how inherently silly it is to try to rank things as wildly different as Faust and Toonstruck on the same scale—- and no amount of handwaving in the introduction is going to change that. But on the other hand, I’m already getting caught up in the horse race, glad to see that the Runaway series ended up with the dregs where it belongs, hoping that Day of the Tentacle will join it soon (rather than being at the very top of the list as it was last time), hating that The Dig is at such a low spot, wondering what I would put on the top spot (I guess Monkey Island 1 is, for better or worse, the quintessential adventure game), etc. In any case, this list has already given me ideas for good games I haven’t played yet and that I should give a chance to, and I’m sure there will be many more in the coming days, and for that I am grateful. Awesome, this’ll be something to look forward to each day! :-) Nice to see that Gold Rush! made the list. Why don’t you review some of these games, like Space Bar and Gold Rush? I would love to read your take on them, but they’re conspiciously absent from the review boards. We reviewed Gold Rush, but yes, there are some we haven’t, and revisiting these older games for the list has motivated us to get those covered. Really it’s as much a matter of availability and compatibility at this point. We don’t all still have 20-year old games on hand anymore, or have success getting them to run. But we’ll try! Kurufinwe, that’s the spirit! Finally, the TOP 100! Every thematic website should have one of those) I remember earlier TOP 20s on AG, but they weren’t that fulfilling, and they were really only one man’s point of view. So far I’ve only got one big complaint - The Dig. It is not only a great adventure game on its own, but it is also one of the best sci-fi games, with an original, developed story and universe. It is one of the earliest and most organic adventure/puzzle mixes that overshadow Myst. And I’m not even talking about the music, which is arguably one of the best scores in gaming history. The game is at least TOP 50 material. Won’t there be a vote for top 2011 adventure games? That’s the Aggie Awards Totally different animal. And yes, that’ll happen in February, as usual, including the reader vote. I think the last Top 20 list was in April 2004, so this Top 100 list is long overdue. There have been some great games in the last 7 years so it’s natural to expand the list. Plus, it helps people like me who like to organize lists of games they’ve played, plan to play, etc. already have to disagree, strongly. Toonstruck is far better than The Dig, for starters, yet precedes it. Runaway is just tripe not worth revisiting.. not sure I will bother with the rest to be honest. Bugger the fact you allready went through the ***1/2 section probably means no BS3, SF: Tunguska or Lost Horizon on the list. I never expected them to end up very high but not at all? Shame. Also imo: Runaway 2 wipes the floor with Runaway 3 whom I consider to be the least good of all installments. I’m not looking at the rankings at all. Already half the games posted are ones I haven’t played, and that’s why I read these lists. I don’t really care whether my favorite game is at #1 or #100 if it’s on the list. Looks good so far. Iv played half of these first 10 games and i agree with their positions. Iv never been a big fan of the dig, despite its nice production values. The puzzles are boring and tedious and the story goes real flat imo. The atmosphere is nice though and its certainly worth a look for anyone who considers themself an adventure-gamer. Woot, this is so much fun! I can’t wait to see how many of the games in the list I have played! And it’s a perfect opportunity to find out what games I missed but really must play. And yes, of course I already hate this list but of course when composing a list like this you are like a politician in the sense that you never do it right. One request: when everything is published, can you then make a list of links to the descriptions of all the games? Oh yes, there will be a complete list of all the games at the end, with links to their respective article pages, if that’s what you mean. Kudos for giving respect to The Dark Eye! That said, I will very disappointed if there are no Legend Entertainment titles featured. It would be nice to have the year of release next to each title. But nice work! , i love these lists although you can never agree 100% with them. Some great choices on Day 2! Good to see Laura Bow. Also, very pleased to see Dark Fall 1 - a classic I only recently played. The 7th Guest absolutely had to be included on this list. 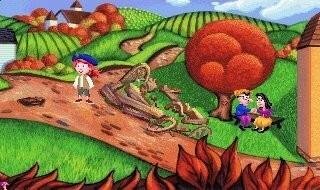 It’s hard to overstate how exciting it was when my brother and I got a CD-ROM drive and loaded up this game. It was so different and exciting. Sordy-wordy, the release year is listed in each and every write-up. Have to give people some incentive to actually read them. So far I can’t agree or disagree with any selection. When it gets closer to the top ten or twenty is where my hackles might rise. It’s nice to see Spycraft and The Dark Eye made it to the top. While not mainstream or well-known, they fully deserve it. What a fun feature! Several of these games bring back fond memories. I also see quite a few classics I haven’t played, some of which I had completely forgotten. I’m enjoying those informative write-ups as well. I’m very excited to discover the remaining 80! List continues to look very good. Quest for glory 2 is a favorite of mine and would definitely rank better on my list (especially if you count the drastic improvement by the agd remake), but still a solid write-up of the game. Awesome list, I’ll save it for future reference! Should the Quest for Glory series even be nominated for the TOP100 Adventure game? In our books, they should. QFG is a breed all its own, but clearly as much adventures as RPG, unlike Elder Scrolls or any other RPG series. QFG is definitely “adventure” with “RPG” elements more than the other way around. It also helps they come from Sierra. Yay SH: The Awakened made it to the list! You might wanna review that review though considering you placed right in the middle of 4 star territory. Plus I think it deserves that extra star. Oops, actually that’s not correct. The further I get the more the ratings drop. That can’t be right, can it? Review scores have nothing to do with this list. Obviously most will be highly rated in both, but not all. For one thing, a review is ultimately just one person’s opinion, and this is a full staff effort, and a review is also frozen in time. It doesn’t factor in legacy, subsequent enhancements, etc. The Awakened, for example, was considered at least in part because of its remastered version, which did something no other game has ever done. Steam just now has an excellent offer of the Frogware Sherlock series including Awakened. Bargain prices. I’m really enjoying this list, too. I know the greatest game of all time probably won’t make the pinnacle but I can live with that…I guess. It’s entertaining to read what seem to be well considered opinions about so many games I haven’t played and might like to one day. @Jackal: I see, that makes sense. Thanks for clarifying that. Loom is No. 61??? It would be a sin to not include it in the top 25. Agreed, Loom is one of the most unique and wonderful adventure experiences, way ahead of its time. And BoUT, Drawn, The Awakened might belong to the “Top decent adventure games of the last 5 years”, but Top 100… Well, at least Shadow of the Comet made it. Now my soul can rest in peace. I like Black Dahlia’s inclusion. It’s a great game, apart from some extremely difficult puzzles and a silly ending. The first 2/3 or so of the game are fantastic AG storytelling. It’s funny that this site’s review is 2/5 stars, but the game made it onto this list. Huzzah! I would have liked to see Toonstruck and Loom a little higher. They’re both very charming. I’m hoping to see The Curse of Monkey Island near the top. I just recently started playing Black Dahlia again so I’m really happy to see that it made it into the top 100. It’s a wonderful game! I found an installer that extracts all 8 cd’s into one neat bundle on your HD so you can play if from there with no cd swapping. Also had an option to remove those lines from the FMV sequences and to slow it down on dual core machines so it runs really well on XP. Nice idea I can’t wait to see top games. My favorite games so far are not on the list )) Also this list is going to help me find out about games I missed to play. You guys did tremendous work here so one really shouldn’t complain but…Dreamfall on #51? I mean in terms of gameplay it might not be perfect but storywise it’s by far the best game ever made! Imo it deserves a place in the top 20 but then again it’s not my call. Still I think not even in the top50 is very harsh on such a magnificent and awe inspiring game. Hand me that rag, moonbird. My monitor’s dripping, too. Sharing one’s lack of motor control doesn’t tell us anything contructive. I stand by the Syberia 2/ANB recommendation 100%. The only linking thing between the two is that they are 3rd person adventures. Even if I think my brain to breakpoint, I can’t see anything else in common. Even the gameplay is totally different. 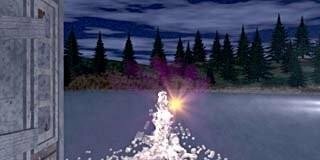 Syberia is uninteractive, ascetic and includes a lot of running, while on the other hand ANB is a crystal clear oppisite: Rich in hotspots, detailed and no running at all. I really would like to hear an explanation for this recommendation. I’m not trying to brag, i’m really just curious, because I can’t find the point there.